In September, the BCCC are launching a free Webinar series with all the legal firms they work with. 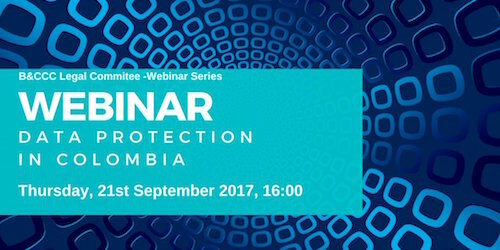 The first webinar on September 21st will be on the topic of Data Protection in Colombia and is to be hosted by top Colombian law firm Parra Rodriguez. You can find more details about how to sign up to the webinar on September 21st here. You can find more information about the chamber here. Since its foundation (History) in 1996, the chamber’s membership base has experienced a steady growth, mainly as a result of continuous efforts to offer useful services and organize innovative events. In the process, it has become quite diverse in terms of the sectors represented: oil & gas, financial services, manufacturing, agriculture, legal services, tourism, business and security consultancy. The Chamber is run by a volunteer Board of Directors composed mainly of representatives from our Emerald Members, the top category of membership, as well as representatives from the UK & Colombian Government officials. The Board of elected officers determine the Chamber’s policies and nominate the chairman. Ad hoc committees are set up from time to time to consider specific issues; this allows members to become actively involved and to apply their expertise to forwarding the organization’s overall mission of forging closer business ties between the two nations. The Chamber does not receive any government funding and therefore operates as a general business, raising funds from membership fees and fundraising activities throughout the year.